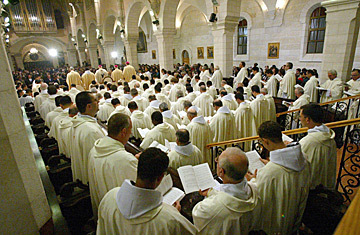 Priests sing the Midnight Mass. In the sleepy parish of Ballyclare and Ballygowan, in rural Northern Ireland, 40 parishioners sit silently in the Church of the Holy Family. Shortly after 9 a.m., the sanctuary doors open, light floods the modest building and Father Eugene O'Hagan glides down the aisle in a white cassock, singing, "In my justice I shall see your face, O Lord."